Last semester Juliette RooneyVarga, Director of the UMass Lowell Climate Change Initiative and close collaborator of Climate Interactive, agreed to try an experiment with me. 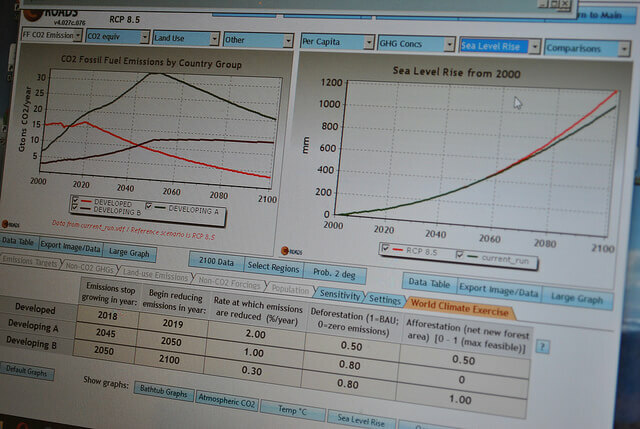 We ran the World Climate simulation in an online webinar class. I am part of the faculty team for an MBA program in Sustainable Systems at Pinchot University. Like a growing number of graduate programs, our monthly, face-to-face classes are supplemented with bi-weekly webinar classes. Turns out, it’s actually not hard to translate this interactive simulation to an online environment. During the fall term in the Pinchot program, first year students take a nine-credit course that integrates sustainability, systems thinking and economics. Climate change is not only one of the biggest sustainability issues of our day, but also has enormous economic impacts and requires a systems point of view to fully understand. The World Climate simulation allowed us to interactively convey the complexity of the issue and the challenges facing policymakers around the world. We use Blackboard’s Collaborate as our webinar platform at Pinchot. Like many webinar platforms of its kind, it allows for screen sharing to show the simulator as well as provides break out rooms for small group discussions. Students can chat with each other and the facilitators using either the chat box or the microphone. Additionally, Juliette created a separate Google spreadsheet in which each team could simultaneously record their decisions during each round as well as a Google document for journaling their thoughts, key insights, and reactions. Each student had pre-selected a country or region of the world to represent prior to the session and came to class having read the two-page briefing associated with their area. We created a breakout room for each of the six regions in advance of the class. Juliette first conducted a briefing on the simulation and then presented some basic facts about climate change and carbon accumulation in the atmosphere. Once they had their instructions for the first round of negotiations and planning, we sent them off to their respective break out rooms to make their decisions. As they came to their conclusions, they recorded them in the Google spreadsheet where they could see each of the other teams entering their conclusions as well. Upon returning to the main webinar room, we had each group present and explain their choices. Juliette plugged the numbers into the C-ROADS simulator and we watched the results and discussed the implications. During the second round, we encouraged students to send emissaries to the other breakout rooms to conduct side negotiations before coming to their new conclusions and reporting to the larger group. We closed the session by inviting students to visit the Google document in which they noted their thoughts and feelings about the experience. I’ve only experienced the simulation once before with a live audience, but I’m not sure the virtual experience was any less impactful. This was validated by the reactions of the students who were engaged and impressed. Our time was compressed to two hours and while extending the time might allow for some of the additional conversations normally included in a live run of the simulation, audience tolerance for virtual meetings probably makes adding more time untenable. Consider audience comfort with technology: Admittedly the Pinchot University students are power users of our technology. They are not only skilled at moving in, out and between the breakout rooms themselves, but also comfortable navigating back and forth between multiple onscreen pages. Because they know each other well and are in the virtual classroom with us twice a week, they are also comfortable with a high level of interactivity during our webinars. An inexperienced audience might require more assistance, such as a co-facilitator who can help troubleshoot any technical questions and guide participants. Inexperienced users may also be more reluctant to speak or otherwise interact during webinars. However, with the growth of online education and virtual meetings, there are more and more audiences for whom this rich, interactive simulation would be a viable option in a virtual environment. Prep participants before hand: Our students came in ready to participate. We distributed the regional briefings ahead of time so we didn’t use precious webinar time for setting up the groups. Use supplemental online materials: Because we pre-created the supplemental Google docs, it was a simple matter of dropping the links to them into our slides or into the chat box so that participants could easily click away to them. Pre-formatting the documents allowed us to visually embed the instructions so students knew exactly what to do with the documents in their break out rooms. Monitor participation: Just like in a live setting, facilitators can drop in on any break out room to monitor progress, provide coaching or answer questions. If possible, give participants their Briefing Statements prior to the simulation and ask them to come prepared to represent their nation’s or region’s interests. Create breakout rooms for each region before the simulation, as well as shared documents for entering decisions and reflections. Do a test run with a co-facilitator to make sure that you can easily switch between slide decks, the C-ROADS simulator, and the Google spreadsheet in which participants enter decisions. If participants don’t have facility using your online platform, enlist a co-facilitator or assistant who can help participants with technical questions and minimize confusion. Limit the event to no more than two hours. While longer periods of time may create greater learning impact for face-to-face events, it is difficult for online meetings to hold participants’ attention for extended periods. A “plenary” session in which each group entered their decisions into a Google spreadsheet and made their case to the rest of the group, followed by the facilitator entering decisions into C-ROADS. A second period in which participants reconvened in breakout rooms, and in which we encouraged students to send emissaries to the other breakout rooms to conduct side negotiations before coming to their new conclusions and reporting to the larger group. A second plenary session, with new decisions entered into C-ROADS. A debrief session in which participants were asked to visit the Google document in which they noted their thoughts and feelings about the experience.